Allison Koltunchik is a case manager at Nyman Turkish PC. Allison enjoys working at Nyman Turkish because of the positive atmosphere, and the opportunity to assist people with the long, difficult process of obtaining Social Security benefits. Allison is often one of the first points of contact for our clients, and she enjoys the opportunity to help them better understand the process. Allison is a graduate of Michigan State University, majoring in Criminal Justice with a minor in Philosophy and Law. 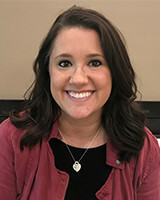 Before coming to Nyman Turkish, Allison interned in the Ingham County Prosecutor’s Office Domestic Violence Unit, and she also worked as an Executive Assistant for Arcelor Mittal Tailored Blanks. Outside of work, Allison enjoys spending time with friends and family, travelling, and being outdoors.